"The Prehistoric Population and Architecture of the Cebolleta Mesa Regi" by Alfred E. Dittert Jr.
During the summers of 1947 and 1948, investigations were conducted in the Cebolleta Mesa area, the center of which is located twenty miles south of Grants, New Mexico. A site survey and a series of excavations were conducted around Los Betios Canyon which lies near the southern boundary of the area. 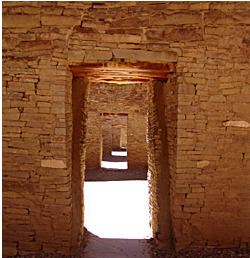 As a result of the investigation, it was determined that the area was occupied by an Anasazi population during recent archaeological times. The sites and pottery reported appear to occupy a time span, in approximate figures, from 800 A.D. to 1400 A.D. The occupation of the region studied includes three temporal subdivisions: early, middle and late. All three subdivisions fall within the approximate date span given above. During the early period, outside influences from the northwest (Chaco) appear to have been strongest. This is demonstrated by the jacal unit and by pottery types. During the middle period the northwestern contacts were supplemented by strong influences from western (Cibola) area. Also during the middle period, the pottery demonstrates contacts with the area of the southwest. The third and final period of Anasazi occupation of the area saw few if any contacts with the northwestern (Chaco) peoples, a weakened continuation of western (Cibola) contacts and loss of many of the the southwestern relationships. On the other hand, influences from the east (Rio Grande), the beginning of which were only suggested in middle period times, were enormously strengthened. Final movements of the Cebolleta Anasazi people could have been only to the east of southwest. At any rate, no objective evidence of their migration in any directions exists at this time.